The Super Soaker Max-D Secret Strike (a.k.a. the Blast Fire) is the new Max-D blaster for 2003. Its name appears to take from a Nerf Gun, also named the Secret Strike, which held an additional hidden Nerf dart for use after the first one was fired. The Max-D Secret Strike holds additional water which can be used even after the main firing chamber is empty. Its design at first glance appears to be a significant departure from older generations. Unlike previous soaker designs, it has a bottom-based reservoir. While this does make the hand-grip area confined to a finite amount of space, it also makes the blaster feel very balanced in one's hand (so long as one's hand fits in the trigger-guard region). The Max-D Secret Strike also has some features unique to this blaster. While it has a separate firing chamber, the reservoir is also pressurized. 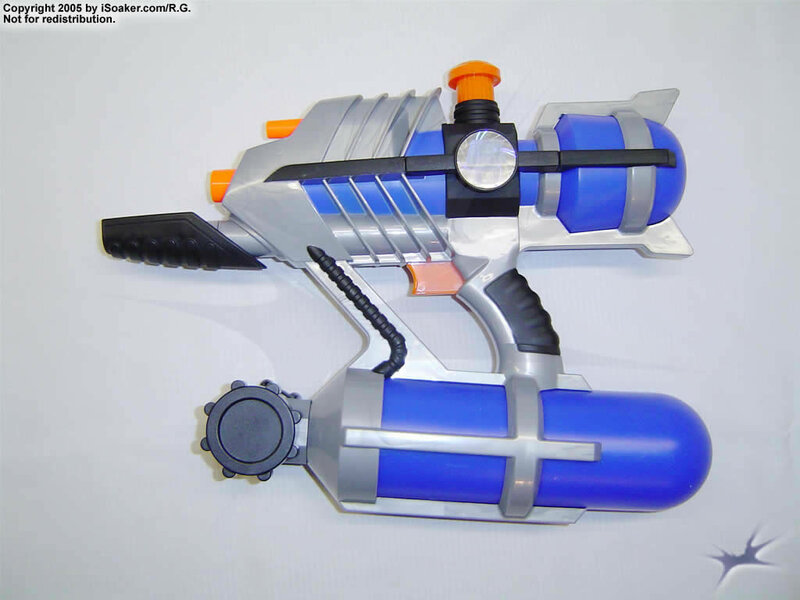 The firing chamber solely feeds the Max-D Secret Strike's fan-blast nozzle while the reservoir powers the main nozzle on the blaster. Pumping the blaster pressurized the main reservoir. When the pressure is great enough, the firing chamber will then be filled with pressurized water. Its primary nozzle has a good output (rated at 1.8x). The stream produced has a good consistency and the Max-D trigger system on this blaster feels more durable than on the initial Max-D line. To activate the secret-strike option, one needs to press down on the large orange button that sits atop the blaster. The fan blast can be a very effective close-range saturation attack. Limiting the amount of water accessible by the secret-strike attack also means that one will not accidentally use up all their water in one long fan attack. It also means that if one has used up all the main reservoir's water, but has never used the secret strike attack, one will still have a good last shot remaining in their blaster. An interesting feature is that after using the secret strike attack, if there is still remaining pressurized water in the main reservoir, it will automatically refill the pressure chamber. One problem is that since pumping pressurizes the main reservoir, to properly empty the firing chamber after use takes a little longer since one has a larger volume that needs to be pressurized. One peculiarity, however, is the pump's placement. Sticking out forward even when retracted, this pump may be hit a lot if one is not careful. As well, its placement just beneath the fan-blast nozzle means the pump will likely catch a little water as the blast tapers off. However, since it requires both hands typically to operate the fan-blast, one need not worry about accidentally soaking one's hand during the blast attack. 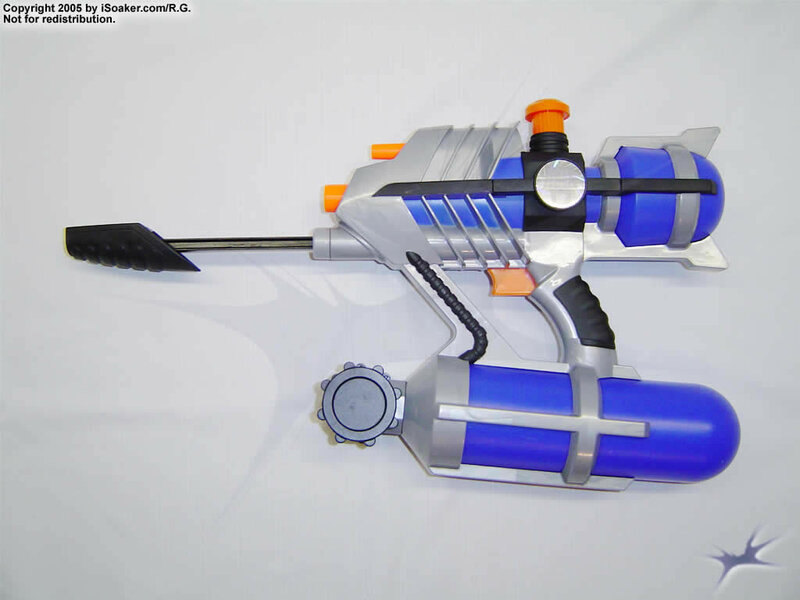 On a design note, the Super Soaker Max-D Secret Strike comes in two flavours: blue on a grey background (the one pictured above) and red on a grey background. Great even as a primary weapon, theMax-D Secret Strike is perfect for small to medium skirmishes and can hold awhile in large ones. Just beware of any CPS-class weaponry as well as larger XPs and XXPs. Nice size, light, easy to carry. Despite its size, it packs respectable power. It also does not take too much effort to pump up the pressure chamber. The tank provides a respectable amount of water. Easy to fill with a nice, tethered cap and translucent water reservoir. The reservoir is at the bottom, balancing this soaker quite nicely. The separate firing chamber for the fan blast helps one conserve water for those up-close-and-personal soaking moments. This is a rather small weapon compared to the others out there. No strap. The trigger guard area and grip is a little short, meaning that larger hands will not be able to have all fingers on the grip comfortably. Care should be taken not to hit the forward-mounted pump when running as the pump does extend the farthest out of the front of the blaster. Emptying the firing chamber when storing the blaster takes longer and is more difficult to do when compared to typical separate-firing chamber blasters. I got this gun as well a several others, this gun is great for close quarters. It has decent range and great balance, that plus the shower nozzle that the previous owner replaced the fan with allows it to dish out lots of soakage. However it is not without faults: the grip is uncomfortable, and being a Max-D, it WILL break regardless of how careful you are. A great little gun but not worth more than $15. I like the shape of this gun. It looks like something the Klingons might have used to blast Romulans. Or that the Romulans might've used to blast Klingons. I don't know. It looks nice though, and that can be attributed to the "weird" shape. The hand-guard, while it may be a problem for some people, gives you two ways of holding it. You can either hold it pistol-grip style in two places, which is great for controlling your aim, or you can hold it in a shortened rifle style. Nice to change things up every now and then. Also, the placement of the tank distributes it's weight very nicely. You could easily hold this thing, fully filled and pressurized, in one hand. The capacity on this gun is pretty good. Unless you're going postal on another team over a long period of time, I don't think you'll run out for a while. I bought this gun because everyone else bought one too. One of my very few "impulse purchases." Due to 20/20 hindsight, I realize it was a mistake. Online, I was sold on getting it because ranges with it had been reported in the fifties. It was touted as the CPS pistol we've all dreamed about. Well, I can pump this thing 60 times, and I still get ranges in the twenties and thirties. Either I got a dud or someone was exaggerating. The fan blast is nothing great either. Unless you're within centimeters of your target, you're just going to waste water. It literally sprays mist. You'd be better off drilling this nozzle out. Maybe then you'd get some use from it. Oh yeah, and the water in the seperate p/c STAYS in the seperate p/c. It is incredibly hard to pump all the water out of this thing. I bet I've still got water in the backup tank from last year, and not because I didn't try to empty it. This gun isn't ugly. Maybe the hand-guard could be a little bigger for bigger kids and adults, but due to our experience with Hasbro in the past few years, I don't think they care much about the older market. The only think I dislike about the styling of the gun is all the extra doo-dads they put on it to flash it up. I prefer my guns bare-bones, function over form. This thing fairly screams Uzi to me. The semi-auto kind, that is. The Uzi fires the weak (for a rifle) 9mm pistol round, the way you hold an Uzi compares very well to the way you hold a Secret Strike, and they're both extremely overrated. It can be kind of nice to round out your collection with a gun like this. Its not a bad gun, and in a pinch, you can use it as a loaner, but don't go expecting miracles from it. It's just another air-pressure pistol. 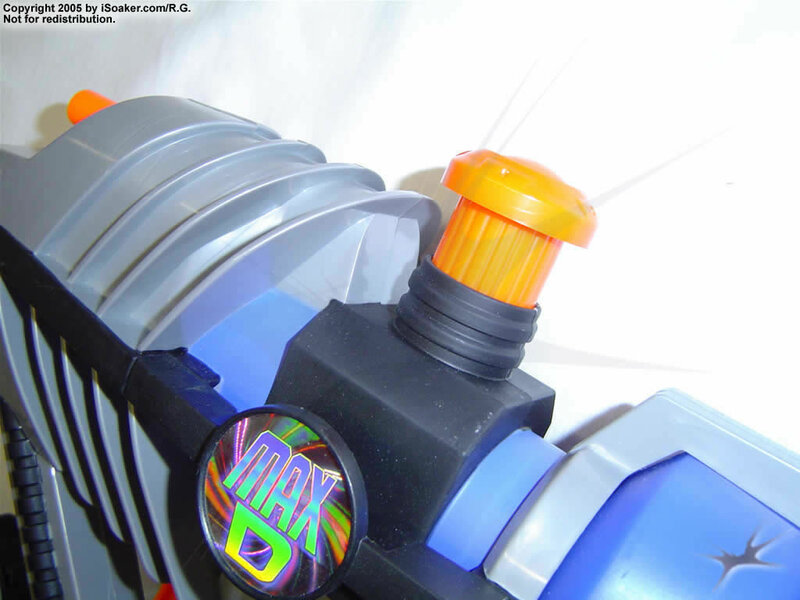 The Max-D Secret Strike is the best Soaker in the 2003 line. But then again, it did not have much of a competition from the EES line. The Max-D SS has a very unique and slick looking design which is a practical design at the same time. The weight is at the bottom, making it comfortable to carry around. The secret strike blast is an added bonus feature if your opponent thought you had run dry. As usual for an air pressure soaker, it has a long shot time and a small nozzle. It might just have a small 1.8X nozzle, but with 10 seconds of shot time, one can still do an acceptable soakage. Its power is also fairly good for an air pressure soaker, but don't go head to head against CPS soakers. The construction is faily solid, except for the pump, which can break if one pumps to wildly in battle. The absence of a strap makes wearing 2 or 3 guns difficult. As as side-arm, I would reccomend a Max-D 6000 and small CPS weapons like the CPS 1000 or the CPS 1200. The CPS 2100 is good, too, but it does not have a strap either. The Max-D SS is mainly a weapon for snipers and people who like to move around quickly. Its worth getting for its very cool huge one-hand blaster look, balanced performance, and the fact its the best Soaker of 2003. I bought my Max-D Secret Strike about a week ago and I must say, I'm happy with the results. I have noticed that the water stays pressurized for quite awhile, but I would not recommend holding down the trigger too long. I have also found that in cases of when you are outnumbered, the spray is very handy in taking ground back. Although it packs a punch, the spray reservoir chamber is frustrating to try to empty after the water war is done. I would recommend you not get mad when trying to empty it. I would recommend this super soaker to anyone as a water weapon.